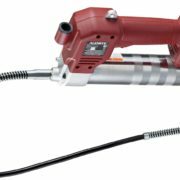 This Alemite 20 volt 4.0A lithium-ion cordless grease gun features built-in intelligence, liquid crystal display (LCD) that indicates cartridge level, battery charge level and grease dispensed. 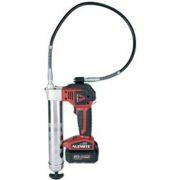 The two-speed grease gun delivers up to 40 grease cartridges per battery charge. 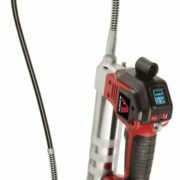 This Alemite 20 volt 2.5A lithium-ion cordless grease gun features built-in intelligence, liquid crystal display (LCD) that indicates cartridge level, battery charge level and grease dispensed. The two-speed grease gun delivers up to 15 grease cartridges per battery charge.